I have always been a fan of Giada DeLaurentiis ever since I saw her on Food Network's Everyday Italian. I learned a lot about food and cooking from watching her show and I loved that everything she made always had an Italian spin on it. 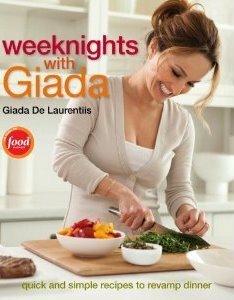 Weeknights with Giada was a great reawakening and reminder as to why I loved her food in the first place. In her latest cookbook, DeLaurentiis is now a busy mom with the task of feeding, not just her and her husband, but her daughter Jade. And as we all know, kid palates can be picky to say the least. So not only does she take the task of creating quick and easy meals in this book, but many of them are kid-friendly as well. I personally do not have children myself, but I appreciated the quick, easy, and yet innovative approach to the food she presents in this book. As someone who is always looking for something new to learn and try in my own home kitchen, I have found that not many cookbooks can offer much that excites me anymore. I feel like I've hit a plateau in what I can learn in the kitchen. So when I find a cookbook with great recipes that have me trying something new, I feel like a kid in a candy store. Not only does Giada deliver on the new and exciting, but she also manages to make good on her promise that the meals will be quick and easy. So far I have made three dishes from this cookbook and all of them have been successes. The one I loved most, however, was the Grilled Cheese with Spinach and Pancetta, which I posted further down this review. 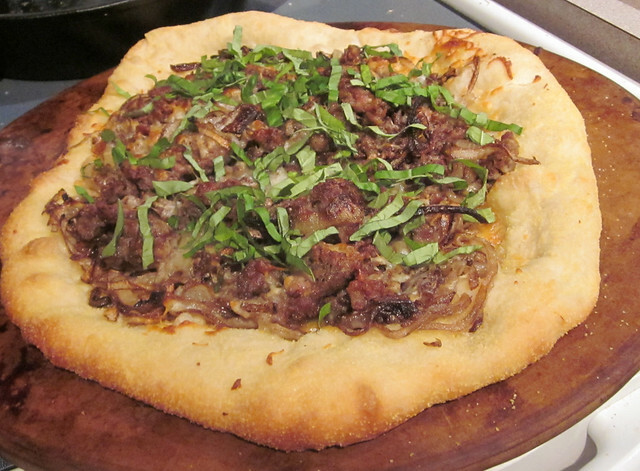 But I also really enjoyed how easy, simple, and delicious the Caramelized Onion, Sausage and Basil Pizza was (pictured here). 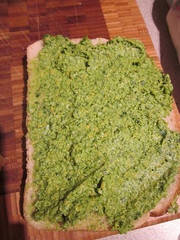 What was so interesting and innovative about the aforementioned grilled cheese was that Giada takes the cheese, spinach and butter and purees it in the food processor to create a cheese spread, so when you grill the sandwich on the panini press, it gets perfectly creamy and gooey in the center. And, as promised, it took almost no time to make. So if you're looking to get out of a weeknight meal rut and want to try something new and different, yet will be on the table in less than an hour, I highly recommend giving this book a try. I always check out cookbooks from the library to "test drive" them first since they can be so expensive. I want to know I'm going to use a cookbook before I buy it. This one definitely delivered in what it advertised and now has a place of honor on the bookshelf in my dining room (when it's not being used, that is). In the following recipe I used prosciutto instead of pancetta because, well, I had prosciutto in the house. To make it more pancetta-like, I crisped it up in a non-stick pan before adding it to the sandwich. 1. Place an oven rack in the center of the oven. Preheat to 400. 2. Spray two baking sheets with vegetable oil. Lay pancetta in a single layer on the baking sheets and bake for 12-14 minutes. Drain on paper towels. Cool for 5 minutes, then crumble. 3. In a food processor, combine the butter, both cheeses, salt, oil, and 2 tablespoons water. Blend until smooth, adding a little more as needed, until the mixture is smooth. Add the spinach and pulse until just combined. 4. Spread cheese mixture over 8 of the bread slices. Top with crumbled pancetta (or prosciutto) and place remaining bread slices on top. Grill the sandwiches in a panini press* until golden and crispy. Cool for 2 minutes before serving. Ooey, gooey, and oh so yummy! *If you're like me and don't have a panini press, there are lots of creative ways to press down a sandwich in a regular non-stick or cast-iron pan. 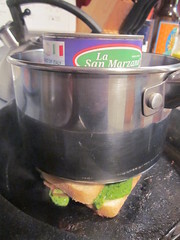 The easiest way for me to do it is to just take a pot or a pan, place it on top of the sandwich and weigh it down with a large can of tomatoes. I like to call this the poor man's panini press (Hey! I save myself $100 from having to buy a fancy panini press). 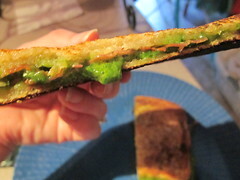 Yes, the sandwich doesn't come out as pretty as it would in a panini press, but it tastes just as good to me. So don't fool yourself into thinking you can't make panini just because you don't have one of those fancy kitchen gadgets that just take up room in your cupboard anyway. Hi Beth! I was so glad that you had a review of Giada's new cookbook. I have thought about buying it several times but was unsure if I would I enjoy it. I am going to add this one to my list. Thanks for sharing the recipe. I will definitely be attempting to make it!